Headlies: James Storm Now Allowed To Grab Whatever He Wants Out Of The TNA Merch Closet - WrestleCrap - The Very Worst of Pro Wrestling! Nashville, TN – James Storm’s return to TNA shocked the internet as many believed that his appearances at NXT events would lead to a full-time contract. Details have begun to emerge from Storm’s new contract with TNA including the surprising clause that was the difference maker in his decision. Carter then lit an entire box of her Dixie Land shirts in an effort to both heat and light the TNA offices. 12 Responses to "Headlies: James Storm Now Allowed To Grab Whatever He Wants Out Of The TNA Merch Closet"
And to think that Braden Walker actually had a more successful WWE career than Storm. Storm then shook his no as he glanced down to see a pile of Brooke Hogan memorabilia gathering dust. 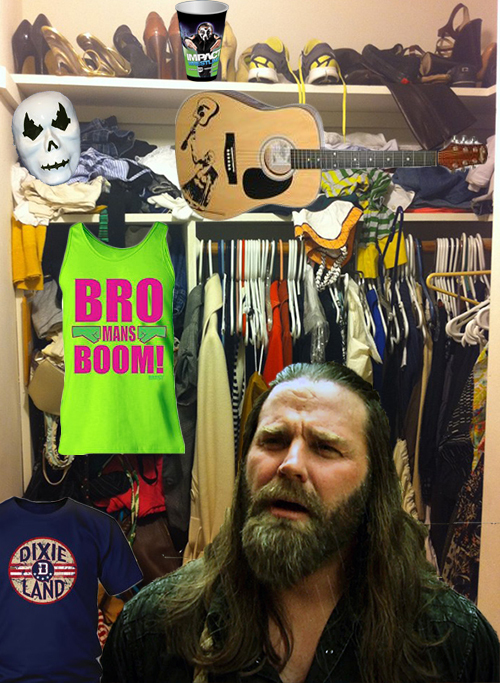 James Storm then added: “You know, this closet is a bit bigger than my trailer. I think I just might move in and make my home in here.” he looked around and sighed then his gaze went back to the Brooke Hogan pile “Gotta do something about that. Clear those out and that would be half the room right there.” When last we saw James he was happily busy sweeping and dusting the closet of cobwebs and humming to himself. Could snag some extra Beer Money shirts and SPEAKING OF that guitar it could be quite handy for getting rid of snow on the ground. He could also sell the guitar to Elias Samson. I think his business scheme in NXT was making acquaintances to then resign with TNA and that closet contract to sell them all kinds of crap from the TNA closet. By the way, I’m pretty sure Mr. Storm is happy TNA let Don West go so many moons ago, otherwise that closet would now be empty with all the merch sold to customers that don’t even know why they bought that crap. I do miss that used car salesman. I’d be more worried about the Hebners, myself. 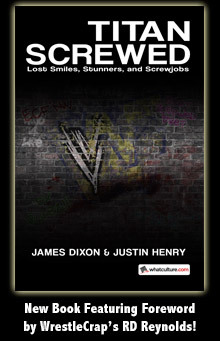 When asked to give a comment on James’ new place of residence, his brother, Lance Storm” shook his head, shrugged and walked away mumbling something about the Storm family finances and mother Storm, affectionately known as, “Hurricane” Katrina Storm. I heard that on the floor of the Merch Closet is empty bottles of Dixieland brand malt liquor. I love that every product you mention really was for sale on ShopTNA.com at one point. Well, at least the dog-tags spelled RVD correctly. And when told of his old co-worker’s deal, AJ Styles shook his head and said “They never offered me free access to the merch closet. Might have stayed if they did. Those Dixieland shirts make for good, cheap toilet paper.” before going back to counting the money Triple H tips him to park his car.